123TeachMe is a free service for students learning Spanish. Our goal is to provide the most comprehensive website on the Internet related to learning Spanish. 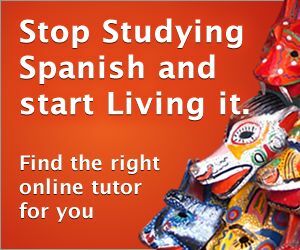 We have Spanish courses, online tutors, interactive Spanish games, a language schools directory, and more. There is a wealth of information here in numerous general and niche courses, as well as a plethora of reference pages. Many of the pages include full audio as well as images or videos. We have other useful tools as well like the verb conjugator tool, as well as daily RSS feeds (Word, Verb, and Phrase of the day). Get to know us better by joining our Facebook page (see box below)! We'd love to hear from you.